Full Service Catering available. 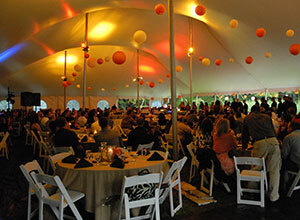 Complete services for the home, office, or off-premise events. Beverage and meal planning. Rentals include: Tents, tables, chairs, china, etc. Party themes, decorations, and entertainment are just some of the services we provide. Let's us help plan your "special" event. Whether it is a backyard Graduation party, Office Block Picnic, Shower, Family Reunion, or a business Grand Opening, we do it all. “The Woods Restaurant” and “Behind the Woods” takes pride in presenting the highest quality Chef prepared food, and owner overseen service, our area has to offer.